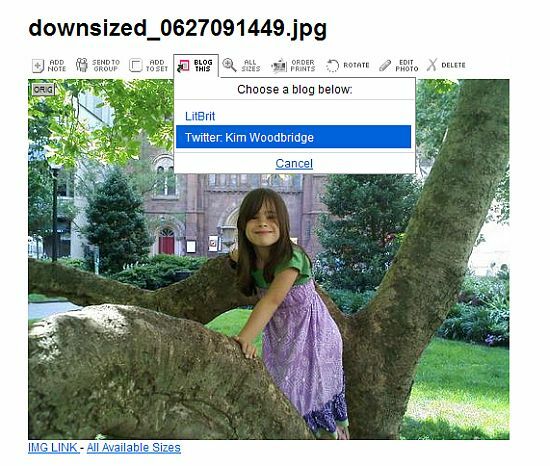 In order to get started you need to authorize twitter as a valid application in your flickr account. This is done by adding twitter as a blog page under your account settings. 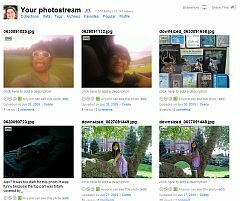 Flickr provides users with an email address that allows them to post photos via a mobile device. I use this to send photos to flickr directly from my phone just like sending any text message. Once twitter is authorized you are given another email address that allows you to post the photo to flickr and send a tweet with a link to the same photo. What you place in the subject line of the email or photo text message, will be the name of the photo on flickr and the tweet sent to twitter. You can also send a link to any photo on flickr by clicking the Blog This button and selecting twitter from the list, if you have more than just twitter listed. What do you think? Is this useful? I frequently send photos to flickr directly from my phone. Actually, I rarely use a camera to take photos – I always have my phone with me but I don’t always have my camera. Rarely though do I have the need to send a tweet of the photo at the same time. The Blog This button could be useful though, especially if a funny or unusual photo is located. Thanks Kim. I just added Flickr to Twitter and my blog. Hi Rick – Great! I hope this helps. I often take photos and want to post them to twitter, so for me it is most useful. Susanne F´s last blog post – How to Transfer a Squidoo Lens? Hi Susanne – Great! I hope it works out for you. Hi Kim. Ok, maybe it’s because it’s early or maybe it’s because I don’t have a Flickr account, but I’m not clear on what the integration of the two services does or allows you to do. tweet about the photo with a link to it at the same time. Often, when I read your blog, I think to myself there are so many shortcuts and tools for doing things automatically. I hardly use any of those. I guess I’m a late adopter of technology! a need for the service. I don’t want to send a tweet about every photo I upload but occasionally it will be useful. I think I will try this out when I get home. I love sharing my photos. Hi Valerie – Great! Let me know how it works. Hi Kim – this is really useful. I haven’t put any of my own photos on Flickr before. But now that I know you can send photos direct from your phone to Flickr, I think I’ll be giving it a shot. And I’ll also try integrating it with Twitter. Thanks. all done. i sent out a flickr tweet this morning. Hi – Darn. I missed it. I’ve been too busy to pay much attention to twitter. I do not use flickr yet but I certainly liked the little one in the photo as well as the background. .-= Ajith´s last blog ..10 Innovative & Interesting Search Engines =-. in downtown Philadelphia. It’s a church in the background. In the past I haven’t posted to Flickr when mobile – I’ve typically used one of the Twitter apps and then syndicated them across to Facebook and Friendfeed and LinkedIn. What I have revisited recently is Posterous and posting from my Blackberry to there, adding a summary and then syndicating that feed to my blog, Twitter etc. You can also cross post to Flickr. 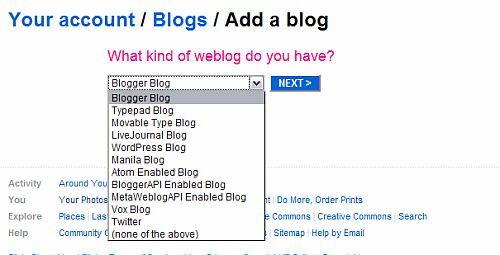 The only down side I have found is that you have to go back to your blog post later to note the categories and key words/tags you want to be assigned to the blog post. There are so many choices – I guess it comes down to personal choice and what your goals are. .-= Krishna De´s last blog ..All Together Now: Budweiser Meets The Bloggers =-. like a good way to do it. method that works well with the way you work. COOL. It’s like TwitPic but attached to Flickr. I can use this! .-= Brian´s last blog ..Zephaniah 3:17 =-. Hi Brian – It’s really good for people who are already using flickr.